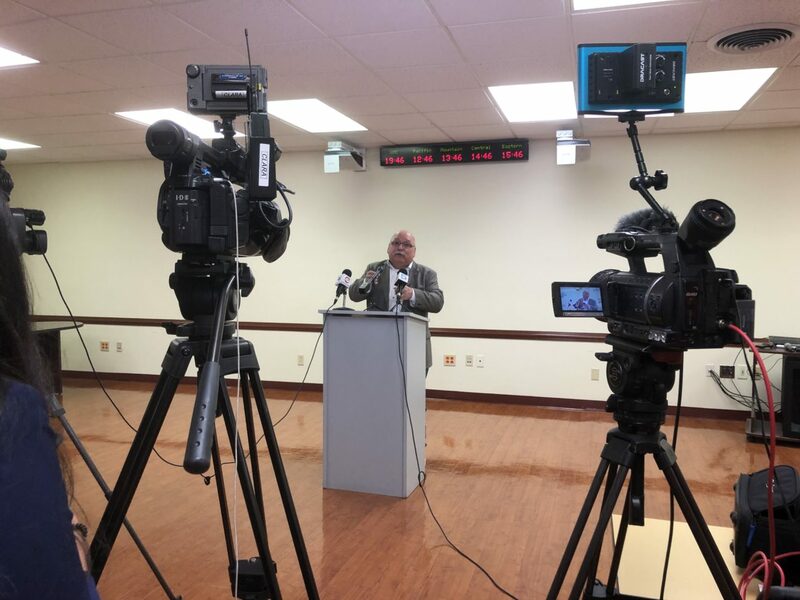 EDINBURG — The number of suspected cases of the mumps in county jumped from five to nine, Eddie Olivarez, director of Hidalgo County Health and Human Services, confirmed during a news conference here on Friday. The county is awaiting lab results for the suspected cases, which are expected to arrive by the end of Friday or Monday. The county will mail a letter to those known to have been exposed to any confirmed cases, Olivarez said. Olivarez stressed that there is no established link between the mumps outbreak and the release of immigrants from overpopulated immigration facilities in the county. Residents who attend the Tru Fit on Griffin Parkway in Mission said they were evacuated from the gym at about 7:25 p.m. Thursday. That location, and the gym on Conway, were both closed Friday and are expected to reopen Saturday, according to an employee. The gym sent a letter on Friday stating that the closures were due to being made aware of a mumps case, and the facilities’ equipment is being sanitized. The mumps are extremely contagious and spread through close contact and prolonged close contact, such as kissing, sharing cups or water bottles, practicing sports together or living in close quarters. “This is a social illness,” Olivarez said, adding that it’s normal for the county to see a few cases of mumps a year, but it’s almost always in children. What makes this outbreak unusual is that it’s among adults. The good thing about Hidalgo County, Olivarez said, is that the vaccination rate here is high, at almost 90 percent. The MMR vaccine, which is administered at a young age and often required for registering in public schools, is still only about 90 percent effective. But those who are vaccinated and contract the infection can expect to experience milder symptoms. Olivarez confirmed that several of the suspected cases were among vaccinated individuals. The mumps are rarely fatal, however. The biggest issue, Olivarez said, is the burden it puts on the infected persons. Often the quarantine period can last up three weeks; that’s time off work, school or other responsibilities.